[Arnuschky] was looking for a network storage solution that included redundancy. He could have gone with a new NAS box, but didn’t want to shell out full price. Instead, he picked up a Dell PowerEdge 2800 and hacked it for SATA drives and quiet operation. It’s not surprising that this hardware can be had second-hand at a low price. The backplane for it requires SCSI drives, and it’s cheaper to upgrade to new server hardware than it is to keep replacing those drives. This didn’t help out [Arnuschky’s] any, so he started out by removing the SCSI connectors. While he was at it, he soldered wires to the HDD activity light pads on the PCB. These will be connected to the RAID controller for status indication. 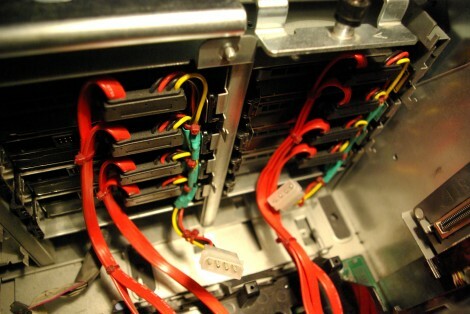 The image above shows the server with eight SATA drives installed (but no backplane); note that all of the power connectors in each column are chained together for a total of two drive power connectors. He then applied glue to each of these connectors, then screwed the backplane in place until the glue dried. Now the device has swappable SATA drives! His server conversion spans several posts. The link at the top is a round-up so make sure you click through to see how he did the fan speed hack in addition to the SATA conversion. If your tolerances don’t allow you to glue the connectors like this, check out this other hack that uses shims for spacing. I have had ready access to server hardware for years but the real killer for reusing it at home has been power consumption. It’s good to see it reused, I’ve seen to much of it go to waste when its decommisioned. Yes, power consumption is a concern, but in our case (see below) I decided that it’s worth it. You must now turn off your computer. Question: Where do i get second-handed server hardware? *The local university surplus equipment sales/auction department. *City/county/state auctions — much is sold for metal content, so you can pick up some bargains if you know what to look for (I once picked up an AS/400 mainframe for $10, and it was equipped with a then-current 30-disk SCSI RAID array). Where I live, there is a place called Resource2000 — which is basically a giant recycling depot. I’ve obtained everything from hardwood flooring, tools, a hot tub, several servers and racks, etc. for next to nothing. Lot’s of places have non-profits like this. I know that places like HP used to have quarterly “recycling days” where any surplus hardware is put into the hallway and made available to (1) other departments, and then (2) employees for personal use. While I wasn’t personally eligible (I was a contractor and not a full employee), making friends with a real employee is a useful exercise. They do make you promise not to resell, though. After “recycling day” is done, I know that local HP hires a 3rd party to haul the rest offsite for killing proprietary software/hardware, general refurbishment, and sometimes resale. If you do sys admin or infrastructure stuff you will end up taking lots of this sort of stuff at home for free.. I used to have enough little UPS for everything in my house to have it’s own. If you work somewhere but not in “IT”, get friendly with one of the people that is in IT and they might let you nick some stuff from storage every so often. Depending on what the company is doing you might get some nice unusual parts. Other than that.. you can pick up older Xeon boxes on ebay for about $200 now ($60 or so shipping though).. I got an 8 core (2 x 4) 1u HP for that much recently. Other than that, there are companies that resell equipment from companies that have been liquidated, but that is only cheap if you want a whole rack of machines. The things to note are: Smaller boxes aren’t designed to be used for storage, a 1u box is only going to have 2 drive bays and if its an older machine it is going to be SCSI, so make sure it’s got a SATA backplain before you buy. 1u boxes are also noisy as hell and probably not something you want in an apartment. Bigger boxes that are designed to be used as file servers for a domain or something (i.e. the fat boxes Dell sell) will have more ports, but they take up a lot of space compared with an Atom board in a NAS case. The only real advantage I can see for server hardware over cheap consumer hardware is redundant power supplies and lights out management.. the cost of a second hand rack mount box isn’t that much different to a cheap atom machine. That’s one of the reasons why I went this way, additionally to the maintainability. Servers are designed to be serviced, while consumer machines are crammy little plastic boxed that are horrible to work with. I have HP stuff and I can’t make it quiet enough for anything. Tesla wants a straw so he can suckup more power. We haven’t got the power Jim. I like reusing old equipment as well. I just did a similar conversion for a couple of 1U servers with dual-core 2 GHz Xeons. The blowers are so obnoxious (even just ONE) that I can’t stand the sound, even with the server in the basement. I had to swap all the fans and hack the firmware of the embedded controller to get the server quiet. But now it’s more silent that my desktop. i just don’t see a purpose to this. You can purchase a mini itx atom based board with 6 sata ports and 2 pci expansion slots, some 2×4 and a cheap fan from the garage and have a silent system. You download UNRAID and run it off of a USB stick, and since Atom dual cores are now for almost all offerings passive cooled, there’s zero noise. Not to mention, when running with 8 2TB drives Sata you are sapping a whopping 45 watts max. Simple: FREE >> something you have to BUY ($$). If the electricity is not free, “Free” hardware can end up being way more expensive. Well, you have to be *intelligent* about it..
Well, I went this way a couple of times before, but I just grew sick of consumer grade plastic-based hardware. I love well-engineered modular enterprise servers, first for their maintainability, and second because they offer features that I value (remote access, redundant power supply etc). Additionally, I used software raid and pseudo-hardware raid before, and I think it does not offer the reliability and maintainability of a proper hardware solution. Of course, power consumption is a problem, but the server’s the heart of a shared house and we split the power consumption 6-way, but buying the thing I did on my own. So it all depends on your preferences… Additionally, the power consumption is with 195 Watts not as bad as I expected (actually it’s quite close to the beefed up desktop machine I used before). I’ve done this before – heck, my current desktop is setup like this. It’s a great way to recycle old hardware. And as others said – link no workie. My current desktop is an old Dell server that I disconnected the drive cooling fans on. NAS box link does not load. Website has major problems. Just remember that SATA connectors aren’t designed to be swapped often. Their guaranteed lifetime is measured in _dozens_ of insertions, not thousands. Want to swap SATA drives back and forth without wearing the connector making the drives useless within days? Then get those drive bays with removable drive container, not the ones you put the naked disk in. All SATA bays designed to host the naked drive WILL wear its connector contacts in a matter of days/months, unless you stick the drive in there without touching it until the day you swap in with a newer one. >>aren’t designed to be swapped often. If you are swapping drives regularly on a “server” you are doing it wrong. Drive swaps happen when drives die not every time you want some different files like a DVD-ROM. Anyway, the SATA spec lists 500 cycles for backplane/blindmate application, which seems to be enough. I think we DDOSed his site.. shame i would have loved to see the build!